Since October 2013 I have been reviewing Big Finish audios for www.planetmondas.com - and now all my reviews are collected here, please take your time to have a read. Long time readers may remember that I lament the loss of the “pure historical” – and while I enjoy the pseudo historical and celebrity historical nothing really matches the drama of the pure historical from the first couple of Hartnell seasons. Even the sole Troughton entry into the historical sub-genre “The Highlanders” was more an amalgam of historical novels and folklore of the time rather than a true historical. 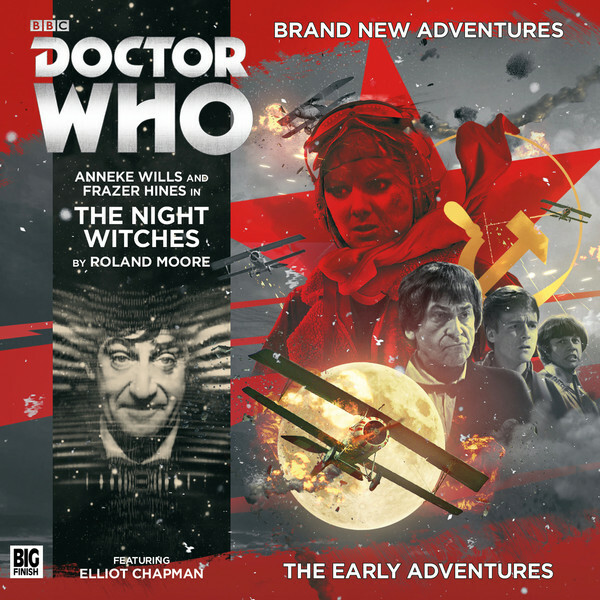 This months release, the first in the fourth series of The Early Adventures redresses the balance somewhat and gives us a true Hartnell style “ordeal historical” and also educated me. so bring on “The Night Witches”…. Featuring the season four TARDIS team of The Second Doctor (voiced superbly by Frazer Hines), Jamie (Frazer Hines), Polly (Anneke Wills) and Ben (the late Michael Craze being replaced by Elliot Chapman) sees the TARDIS heading for The Winter Palace at St Petersburg. Well, they get the right country but unfortunately the right time, our heroes find themselves just north of Stalingrad in 1942, not a great place to be – World War 2 is in full swing and the Germans are advancing. Rescuing a young Russian pilot Lilya Grankin (Kristina Buikaite) when her plane crashes the team are taken to the base of the fabled Night Witches, a crack team of female pilots who carry out silent night raids on the german lines and are very soon taken as German spies by the leader of the Night Witches Nadia Vasney (Wanda Opalinska) – and to top this all off Polly gets the shock of her life when the best pilot in The Night Witches Tatania Kregki (Anjella Mackintosh) is her double – Tatania can even mimic Polly’s voice as before the war she worked on stage as a mimic. So far all the ingredients are there for a classic historical – and unlike the more “larking about having fun” style stories that the Troughton era this goes back to the gritty ordeal style historical of the Hartnell era – the team are split up, forced to go through terrible experiences and are used as pawns in the war that the Night Witches are fighting against the Germans, in war even the good guys lose their morals in the pursuit of victory for a greater good. The story plays out as you would expect and the fact that Polly has a double is used as a plot point that really reminded me of The Enemy of the World, but the fact that the double is Polly who is separated from The Doctor for the majority of the story leave Anneke Wills as the star of the show and allows her to give us much more of the Polly that remained hidden in the few TV episodes that survive – Polly is brave and resourceful and plucky and really does have grace under pressure and an instinct to survive and do the right thing. I also need to mention the rest of the regulars who really do knock it out of the park and the production, though set in the vast snowy wastes of Russia does feel claustrophobic and somehow “studio bound” close your eyes and you can probably see the fake snow and painted backdrops and filmed inserts – it is that authentic. A cracking start to a new series and a fab reboot of one of my favourite genres – a well deserved 9/10.